On this page we post our recent findings . It is updated regularly! Implying that the first 12 digits (3 bytes) are grouped and refer to the road type. The same result appears when you try and route a car on a footpath! Routing starts on a railway line 0x1400 ! Why is some of my TYP file ignored? I recently had a case when the transparent hotels (0x 2b01) on my device were always replaced by an icon I used previously. Answer: the icon for 2b01 was taken from another gmapsupp EVENTHOUGH it had been disabled! There is no point recalculating as it simply will not work! 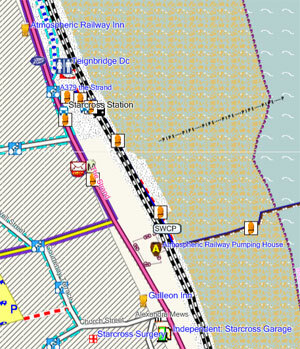 Check Map ID and FID of your gmapsupp on your device and use the same when creating your new map. It does not matter if your 'map descriptions' or 'map names' are different but do make sure your base Map ID is the same and your FID as well. A gmapsupp contains multiple maps, each with a different ID ; these are generally numbered sequentially. Mapuploader 4.89+ contains a tool which checks the Map IDs and FIDs of all gmapsupps on your device. Why is my gmapsupp not showing on my device? There is nothing more frustrating then having just created a gmapsupp which shows perfectly in Mapsource or Basecamp but does not appear on your Garmin device. Answer: two or more gmapsupps on your device share the same Map ID or FID. 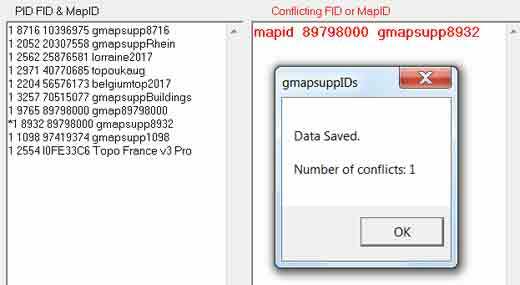 Mapuploader 4.89+ contains a tool to check a conflict of mapids and fids of gmapsupps on your device. In our example, gmapsupp8932 has an FID of 8932 but shares a Map Id with gmapsupp89758000 - it will therfore not be listed on your device! I was very puzzled to see some maps on my device showing grey contour lines, completely ignoring the colours and width set by the TYP file. 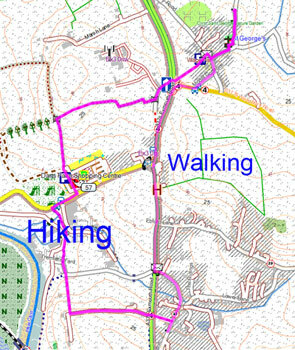 I then narrowed it down to the description of the map embedded in the gmapsupp - what next ! As a result any search for say a 'Chinese restaurant' (中国餐馆) , where the individual name has not been given, results in a blank space and NOT in 中国餐馆. Each gpx seems to represent a country. Basecamp won't accept the resulting gpx files and creates an error; however, with some trickery all caches and hints can be displayed. In its basic form an extended poi , as with non NT ones, has 6 bytes: type number, subtype number, 2 bytes for longitude and latitude. if 5th bit is set then 3 LBL bytes follow long and lat bytes. When 6th bit is set and not 7th bit an extra 3 bytes are added followed by a data stream. ; the length of this stream is variable and can contain chunks of the same size + and extra byte. If 7th bit is set then the end has been reached. Chunks are clearly separated and may contain a pointers. The 3 bytes determine the length of the stream and the structure of its contents, ie 43,33,41 using an understood algo define the stream length as 26 bytes. Various combinations of 3 bytes give the same length,implying that these bytes also provide information about the data stream itself. 3 bits are added when 7th bit is set. Although it mostly contains text , other data can be included as well. If 7th bit is set and the LBL is not set ,then 2 or 3 bytes are used - ie F1 27 - to provide length & other information about the label. This does not apply to non NT imgs - where the seventh bit when set follows an entirely different algorithm and all labels are stored in the LBL etc. This block has a definite length calculated using 2nd (+3rd if even) byte(s) - the algorithm is fully understood. The second or 3rd byte (if length >255) signifies the length of the stream - the algorithm is understood. 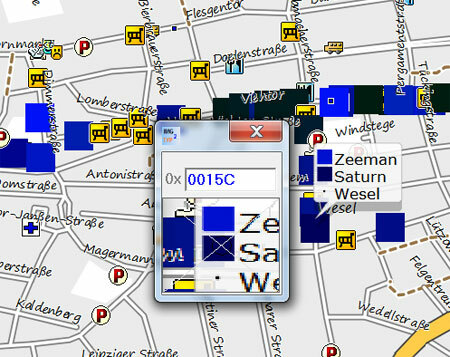 All City Navigator and most TOPO maps contain extra pois - TYPWiz displays them separately. When the 7th bit is set additional bytes are added to refer to the ID found in the TYP file using an algorithm that takes into account properties applying to the POI. Interestingly,many pois refer to Extra POIS not found in a TYP file and can be made visible using IMG2TYP and edited inTYPWiz5 - this is of particular interest with CN TOPO files. CN TYP files contain additional label information essential for the correct display of the icon. if an element (poi line) has not been given a font color then ,if it has text ,it acquires the current font color ! This means , you can get labels to appear in unexpected colors.- pub names could be red, green blue etc depending on the current fontcolor. It seems that colours are not set to black when it can't find a fontcolor in the TYP file. A workaround is to make sure the labels you are concerned about have a font color in the TYP file! Latest version of Mapinstall - 4.0.4 - has some very useful features. However, you may find maps selected and so called installed on your gps may not appear;it does not necessarily create gmapsupps if the imgs are not created by Garmin. A safer way is to use mkgmap or Gmaptool to combine your IMG & TYP file . It seems these are reserved for a particular reason rendering them transparent ,even in Basecamp! This annoying error can occur when the 'search properties' do not tally with the map. Quick solution : make sure your initial 8 digit mapnumber and FID are ALWAYS the same. Mdx files tell Mapsource / Basecamp which img files to use. When creating a 60x19 POI and 1/3 of the POI from the RIGHT is transparent then the POI cannot be shown - in fact the whole tile cannot be rendered. This applies to truecolor and non truecolor. If the image is reversed or you place a small dot on the right then it works again! SInce my software update Feb 2014 these do not get rendered on my oregon 600,despite showing up on Basecamp!